About Byron P. Message Byron P.
Byron was awesome!!! He took us to some local spots on the way without taking too much time and also told us how much money to spend when they asked for more! 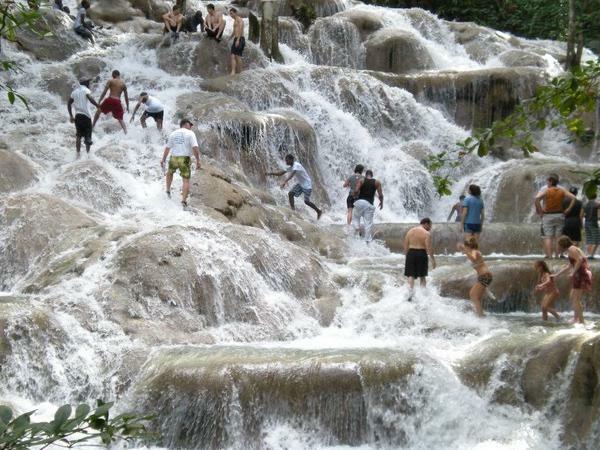 Dunns river was super busy but still definitely something you have to do! The Blue Hole was our favorite. Maybe the huge population hasn't found it yet, because it was't too crowded, but definitely worth it! We laughed so hard at all the things you do - that you say you definitely won't do! Byron also rebooked us on other trips w/in a day! Byron was professional and informative. Our van for the 7 hour adventure was clean, comfortable and in good working order and the air conditioning kept our group of four very comfortable. Byron set up this tour for us as I requested, and we had a great time! Long drive from our resort through the countryside, but Byron kept us engaged as we learned about Jamaica from his perspective. Everything was very professionally organized and our day flowed nicely visiting Appleton Estate and the crocodiles on the Black River. I highly recommend Byron, and if we are ever back in the neck of the woods we'd look him up in a heartbeat! Byron was really outstanding. He was punctual, knowledgeable, flexible (tour to our specs and a bit "out of his comfort zone"), pleasant and fun. Because of him our memories of Jamaica will always be much better than if we would not have had him as a guide. Thank you very much Byron. Bart and Francoise from Belgium. He was so accomdating and so knowledgeable. Thank you Byron ! My group of 10 did a customized tour to Dunns River Falls and then had lunch at Miss T's - an authentic Jamaican restaurant. This tour did not disappoint! Byron, our tour guide, was excellent. He was very warm ,hospitable, knowledgeable and made us feel very welcome and comfortable on this tour. His bus was very clean and comfortable. He was punctual for our pick up and got us back to our cruise ship on time. I will use Byron again and will definitely recommend him to family and friends. We had a great tour of Jamaica with Byron and highly recommend his services. Thank you! Thanks to Byron & Maxine we had an amazing trip to Nine Mile with so much information about the Parishes and surrounding areas on the way. An excellent & worthwhile trip and a very enjoyable day with our awesome guides. Excellent excursion. Wonderful with the children. Byron has been an outstanding guide for our Negril tour Very knowlegable, professional and accomodating Highly recommended guide Thanks Byron! TOUR GUIDE RESPONSE: Thanks very much Sir and thank for choosing me as your guide. Our guide was so knowledgeable and had an interesting personality! We really enjoyed hearing about Jamaica and this tour! Byron was absolutely wonderful. I recommend that anyone visiting Jamaica who wants to laugh all day and learn something at the same time, secure his services. He was terrific!! Would sign up again with him in a heartbeat! TOUR GUIDE RESPONSE: Thanks Allison for taking the time to provide a feedback for my services. Had a great time with you guys. Byron showed us a wonderful time in Jamaica. He is an excellent driver and is flexible with the itinerary. He took us to a great restaurant with excellent "jerk" chicken, etc. Thank you for a wonderful time at Blue Hole. Great day trip with Byron, he was prompt very accommodating to our group of 12 people's needs. Shared lots of historical and cultural information, answered all our questions and added some humor also! Everyone enjoyed the day! Thank you Byron! TOUR GUIDE RESPONSE: Thanks for the feedback. Really appreciate it. We had a great time he was very knowledgeable about EVERYTHING got us to Dunns River Falls before the crowds so we had a great time took us to a local restaurant for amazing lunch. Best way to go don't book through cruise ship and have to play by their rules and time schedule get your own local guide and make it up as you go how you want it! We really enjoyed our tour. The Blue Hole was fabulous! What a beautiful place. Dunns River Falls also fun the only negative there was it was really crowded and there were not that many cruise ships in port. Still a beautiful place and fun activity to climb the falls. Byron was fabulous and provided us with a great guide at the Blue Hole. Our transportation was nice and we appreciated you tailoring the tour to what we wanted to do. Fabulous day in Ocho Rios! Everything was perfect. Byron is a very good guide! Byron was awesome! Really enjoyed the private tour. Byron (and Byron) were excellent hosts- very knowledgeable and very friendly, our group felt relaxed, we were never rushed, and we will definitely use Byron for another private tour the next time we visit Jamaica! Thanks Byron ! Outstandingly memorable day for our entire family! Byron came with new and comfortable bus for our family of 16, ages 5 to 74, in Jamaica to celebrate our 50th Anniversary. Spent a 12 hour day together happily adventuring from waterfront to mountains through cities and villages,enhanced by excellent and entertaining commentary with stops at Dunn's River, the Blue Hole, local eateries, concluding with night wonder at the Luminous Lagoon. Byron and sidekick Maxine guided us with attentitive warmth and care. Byron gave us the tour we wanted in a most professional way. Enjoyed time with Byron. Exceptional tour guide. Knowledge of Jamaica is amazing. Due to weather issues, had to modify tour on the go. Byron made quick adjustments. Result was still an excellent tour. He is friendly and outgoing. Excellent English language skills. Guaranteed to have a great experience with Byron as your guide. I will use him in the future. Byron went above and beyond. He was an amazing tour guide, very informative and made us feel like family. Highly recommend. Byron is an excellent and accommodating tour guide with a Jamaican sense of humour! He provided our group an overview of the region that included areas that regular tours don't get too. Very professional guide and excellent quality vehicle. TOUR GUIDE RESPONSE: Hi Daniel thanks for your feedback really appreciate it. Byron was An excellent tour guide. Not only did he show us the touristy areas but also the real Jamaican neighborhoods along with the history of your island. I would highly recommend Byron to anyone looking for a great tour. TOUR GUIDE RESPONSE: Thanks Edward. Appreciate the feedback. Me and my husband had a day with Byron just would like to say a few words. He was AWESOME. Thank you. We had a fantastic day with Byron! After the pick up we went to the blue hole and , wow, this experience is a must! My kids are still speaking about it! Of course also Dunns River Fall is very nice, but the blue hole was the highlight! Thanks to Byron who was the perfect guide on this day and took care of all of us. He brought us also to a fab place to try the local cuisine. We can highly recommend Byron as a tour guide!! TOUR GUIDE RESPONSE: Hi Stefanie thanks for taking the time out to review my service I really appreciate and hope to see you again in paradise ya mon. Byron is an excellent tour guide. We took this tour as a shore excursion in Jamaica. He waited for us patiently to disembark from Liberty of the Seas. The ride on the van is very comfortable. No problem with air conditioning. And no long lines compared to the ship sponsored tours. Then he took us to a nice restaurant as per our request. Our family really enjoyed this trip. Thanks a lot. TOUR GUIDE RESPONSE: Thanks for taking the time out to review my service it was my pleasure. Outstanding!!! I know who I am using next time. TOUR GUIDE RESPONSE: Thank you for taking the time out to review my service see you next time. Easy to work with, knowledgeable, flexible. I would highly recommend! Byron is good driver, good new comfortable minibus. Blue hole is Super. But you get the most of the visit if you are a good swimmer. Dunns Falls also Super, but also only if you do the walk up trough the falls. Very knowledgeable about the area. Friendly and very easy going. Thanks Bryon for a great day. Byron was very helpful. He showed us areas of Montego Bay only a local would know. Took us to Greenwood Great House which was a highlight and we lunched at Scotchies! The best Jerk chicken ever. TOUR GUIDE RESPONSE: Thanks for your review. Byron was a great guide! He was personable and knowledgeable, and he was very flexible with what we wanted to do. We had a great time at the Blue Hole, and he made sure our experience was as fun and fulfilling as possible. As a driver, he was comfortable and safe. We also had great discussions with him about Jamaica, travel, and food. Finally -- his meal recommendations were the best! We would definitely recommend taking a tour with him, and we fully intend to seek him out again when we return to Jamaica. TOUR GUIDE RESPONSE: Thank you for taking the time to share your experience. Your review is greatly appreciated. Did a great job, looked after us and enjoyed his tour. This tour guide was wonderful and I apologize for not reviewing sooner. Byron told us a lot of folklore and in return my father-in-law told him world war II veteran stories. Very interesting. The tour was great - you couldn't have asked for a better day. What a way to see the island and you are not on a bus. Our great tour guide made it all about us!!!! We traveled with our disabled elderly parents. Byron was kind and very patient with us. We had him booked for 5 hours but we were not finished with our tours because of difficulties getting around. He kindly allowed us to take our time and we were able to do all we wanted to. TOUR GUIDE RESPONSE: Thanks Craig for taking the time to rate my service. It was my pleasure to show you my beautiful Island home. Hoping to see you again when next you visit Jamaica. Great tour! Byron was right on time to us up. Friendly with a very comfortable van. He was happy to stop for us to pick up refreshments before heading to the Blue Hole. He also made sure he took us to the best stop for the Blue Hole! Thanks Byron! TOUR GUIDE RESPONSE: Thanks guys. I had a great day with you. Appreciate the feedback. TOUR GUIDE RESPONSE: Thanks Angella for taking the time to write a review. It was my pleasure being your tour guide. Appreciate the response. We arrived in Jamaica as strangers and left with a lifelong friend. Byron is now officially part of our family!!! The day was flawless. He gave us the history of beautiful Jamaica, we saw amazing sites & he even took me spice shopping in the grocery store. Byron puts his heart & soul into the tour and we can't wait to visit Jamaica again and spend more time exploring paradise with him. We had three children (8, 17 & 20) with us and he made sure ALL had a good time. Byron was an awesome guide, he made our day trip to Negril wonderful. We loved our trip with Byron. Totally reccomended!! Byron was a great tour guide and was very knowledgeable of the areas he took us around in Montego Bay. We really appreciated the visit to the school he had arranged for us. We would highly recommend Byron. tour in Jamacia by Byron, promp sense of humor willing to show us what we wanted to see not the tourist traps. will be using Tours by Locals again. We thoroughly enjoyed our tour with Byron. He was very knowledgeable and accommodating to our group. He was a safe driver and knows Montego Bay (Byron's Town) very well. Would definitely reserve a tour with him again. We were a family (group) of 9 ranging in age and I must say, this tour with Byron was one of the highlights of our cruise. We were late by about an hour due to the ship not docking on time, we got to the location and within a minute of our call, Byron was picking us up in the A/C cool van on a hot Jamaican day. Byron was vey informative, polite, professional and the ability to create our own tour was priceless. HIGHLY recommend; Byron was the man ("Yah-Mon" that is!!) Thank you Byron!!! Our ship was due to dock in Falmouth and could not get in due to wind so went to Montego Bay. My cell phone was left in the car in Detroit airport so I could not reach Byron. No worries though, Byron managed to find us even though we were not even in the same port we were supposed to be in! Byron was excellent at readjusting the tour to a new location, and a new time schedule! As the tour went on we not only saw the sites, but Byron taught us Jamaican history and way of life. No doubt a 5 star guide! TOUR GUIDE RESPONSE: Its very nice of you to review my service. I really appreciate it, thank you. Byron is an awesome excellent guide. We highly recommend booking him for a tour. It was quite evident that Byron is a safe excellent driver as he navigated through the winding mountain roads to the Black River and then Negril. He was very knowledgeable and passionate about his job and his country. We spent the entire day together and Byron made it very memorable. We were so impressed with Byron that we called him to take us to Montego Bay later that week and again received the best experience. TOUR GUIDE RESPONSE: Thank you Linda. It was my pleasure being your guide and I am glad I help to make your holiday a memorable one. Thanks for choosing me as your guide.